This month's featured author is Maya Angelou. I had someone else in mind, but at trivia night a few weeks ago she was the subject of one of the questions. I was amazed that my table mates didn't know more about her. The average person knows that she wrote I Know Why the Caged Bird Sings or they remember her inaugural speech for President Clinton, On the Pulse of Morning. You may know her for her poetic stylings in Still I Rise or for the younger generation, as an elder in Tyler Perry movies. Readers, I'm here to tell you that Madame Angelou has lived! I picked up her then complete collection as a freshmen in college 20 years ago and was blown away. 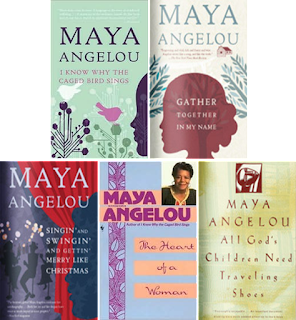 The books shown above cover her life from the beginning with I Know Why the Caged Bird Sings (1969); the ages 17 through 19 as a single mother working as a prostitute and madam in a brothel in Gather Together in My Name (1974); Singin' and Swingin' and Gettin' Merry Like Christmas (1976) covers her marriage to a Greek sailor, her dance career (did you know she once partnered with THE Alvin Ailey? ), and the recording of her first album. When I tell you Madam Angelou has lived a full life, she truly has. As an impressionable young woman, I was so blown away by her story. Recounting now all that she has done in the time period that's not even covered by these books is even more stunning. My hope is that you will take the time to get to know and appreciate this woman who is truly an American treasure.